At Maria Goretti’s canonization by Pope Pius XII on 24 June 1950, some 500,000 people, mostly young men and women, were in attendance. Maria’s life and death had come to exemplify purity of heart and spiritual strength in the face of temptation. 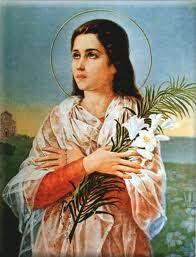 Maria Goretti, born in 1890, is honoured as one of the first Passionist martyrs. She was the daughter of poor share-croppers who lived in the Italian countryside. She lost her father to malaria as a child, and it is this loss that many feel contributed to her sense of strength and maturity. On 5 July 1902, at the age of 12, Maria made her First Communion at the nearby Passionist church. Shortly after, alone in her home except for her little sister, Maria was attacked by Alessandro Serenelli. When she would not submit to his advances, he stabbed Maria fourteen times. She held him off courageously, but was mortally wounded. When Serenelli’s father and Maria’s mother came to check on the little girl, they found the bleeding Maria and took her to the nearest hospital in Nettuno. She underwent surgery without anesthesia, but her injuries were too grave. The following day, twenty hours after the attack, having expressed forgiveness for her murderer and stating that she wanted to have him in heaven with her, Maria died of her injuries. Alessandro Serenelli was captured shortly after Maria’s death and spent thirty years in prison. He remained unrepentant and uncommunicative for several years, although in time he corresponded with a Bishop who had visited him in jail. It was to him that Serenelli reported a dream, “in which Maria Goretti gave him lilies, which burned immediately in his hands”. After his release, Serenelli went to Maria’s still-living mother, Assunta, and begged her forgiveness. She forgave him, saying that if Maria had forgiven him on her deathbed then she couldn’t do less. Serenelli eventually became a Capuchin lay brother, and worked in a convent as its receptionist and gardener until he died in 1970.